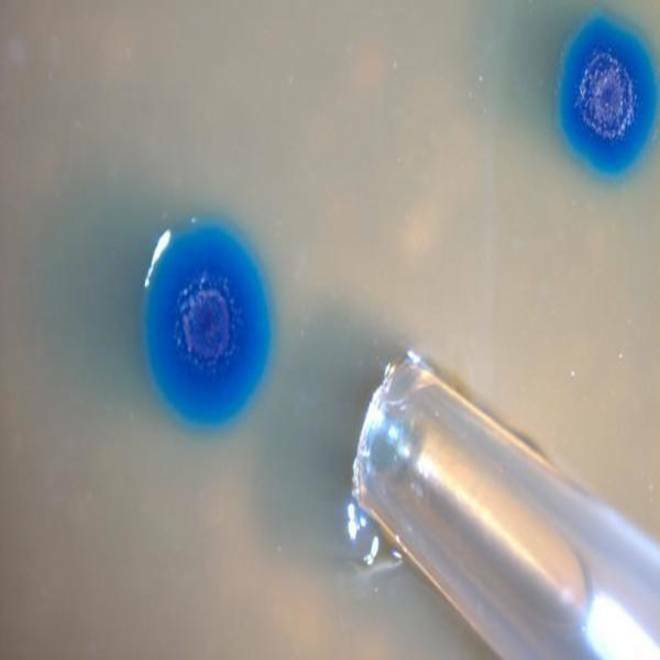 A genetically transformed strain of bacteria takes on a bluish cast as a signal that synthetic coding was incorporated into the cell's genetic machinery. Someday, microbiomes just might give us a world where crude oil is grown like a crop, where vaccines for new flu strains can be produced in days instead of months, and where physicians can tweak the bacteria in your gut to cure what ails you. At least that's the promise held out by genomics pioneer Craig Venter and others at a symposium conducted this week at Seattle's Institute for Systems Biology. A decade ago, Venter was among a cadre of researchers who first decoded the human genome — in Venter's case, his own. Today, as the head of the J. Craig Venter Institute, he's among a cadre of researchers who are not only working out the implications of that genetic code for our daily lives, but also studying how to tweak the genetic codes of the myriad microbes that surround us — and in some cases, live within us. The makeup of those microbial communities is what scientists refer to a "microbiome." A decade ago, the main challenge facing geneticists was to translate the "analog" information of cellular chemistry into a digital database, Venter told attendees. Today, the main challenge is to reverse course and make the "digital to analog" conversion, so that innovations in genetic code can be applied to the real world. How's that done? Venter and his colleagues made a start on that task just a few years ago, by pioneering a process to synthesize DNA and insert it into a strain of bacteria. The daughter cells reflected the artificially altered programming instead of their forebears' natural genetic code. Novartis, a major pharmaceutical company, is working with Venter on techniques to crack the genetic code of an influenza virus strain and pass it along to the vaccine-makers within five days. A quick turnaround is the key to containing the spread of deadly flu strains like the one that killed tens of millions in 1918. "We think we're actually pandemic-ready," Venter said. Several commercial ventures, including Sapphire Energy, are tweaking algae to produce oil-like compounds at a price that's cheaper than the cost of crude oil. Sapphire CEO Jason Pyle pointed out that based purely on commodity costs, corn is a cheaper energy source than oil (though not as cheap as natural gas). If genetically modified algae could be grown in mass quantities as cheaply as corn, it could become a renewable energy source that's much closer to carbon-neutral than fossil fuels. Carbon dioxide could come to be seen as "the raw material of the future," Venter said. From 2010: Algae fuel start-ups across the country are getting closer to commercial scale production of the environmentally friendly fuel, thanks to investment from the government. Algae strains could also be reprogrammed to produce foodstuffs, Venter said. Such genetic twists could outpace today's chemical-heavy agricultural methods, which are increasingly being seen as too wasteful for the planet's rising population. "Ultimately, the elimination of agriculture as we know it should be a goal of modern science," Venter said. However, harnessing synthetic algae cells is "not a short-term project," he cautioned. The bacteria in our bowels may even play a role in space exploration: If we ever get to the point of sending astronauts to Mars, Venter said one of the first items on the agenda should be to replace the astronauts' Earth-centric gut bacteria with a selection more suited to the Mars trip. Venter has said other bacteria cold be engineered to create fuel and food from raw materials on Mars, including the carbon dioxide in its atmosphere. This all sounds like a science-fiction utopia, but some believe there's the potential for a sci-fi nightmare instead. Last month, an international environmental consortium called for a moratorium on the commercial use of synthetic organisms, and an outright ban on the application of synthetic biology to the human genome or the human microbiome. "It is our obligation to safeguard the future, to be wise in our development and use of technologies which could threaten humans and the Earth," said Carolyn Raffensperger, executive director of the Science and Environmental Health Network. The results of an online survey on synthetic biology are due to be released next month. What do you think about the idea using genetically altered microbes to produce fuel, food and medicine? Is it a panacea, a Pandora's Box, or something in between? Feel free to register your opinion in the online poll above, or in the comment space below. What's living on your smartphone?